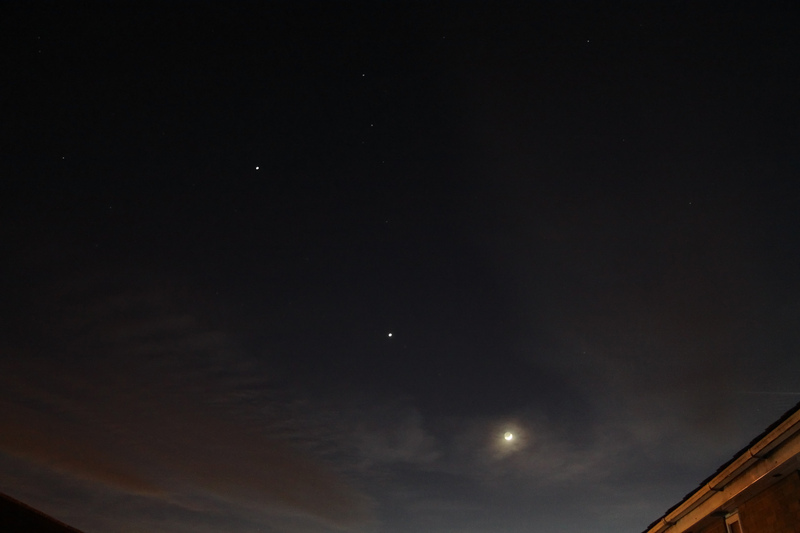 The following two images by Robert Seymour capture the conjunction of Venus and Regulus on the morning of the 3rd October 2012. The two images were taken 2 hours and 46 minutes apart using a hand held Canon EOS 40D. The first image was taken at 03:40 BST using an EF 200mm prime F/2.8 II lens at ISO 1600 and 1/100 s. The second was taken at 06:06 BST using an EF-S 17-55 F/2.8 IS USM zoom lens at ISO 1600 and 1/80 s. Robert comments: "I believe its quite rare for a planet and a 1st magnitude star to have such a close conjunction.  Venus was shining very brightly at magnitide -4.0 whereas Regulus (which is the 22nd brightest star in the sky, I believe) was some 145 times less bright at mag. + 1.4. At closest approach, they were slightly less than 10 arc minutes apart, which is about 1/3 the apparent diameter of the moon. I lost sight of them at about 06:30, once the sun started to rise". 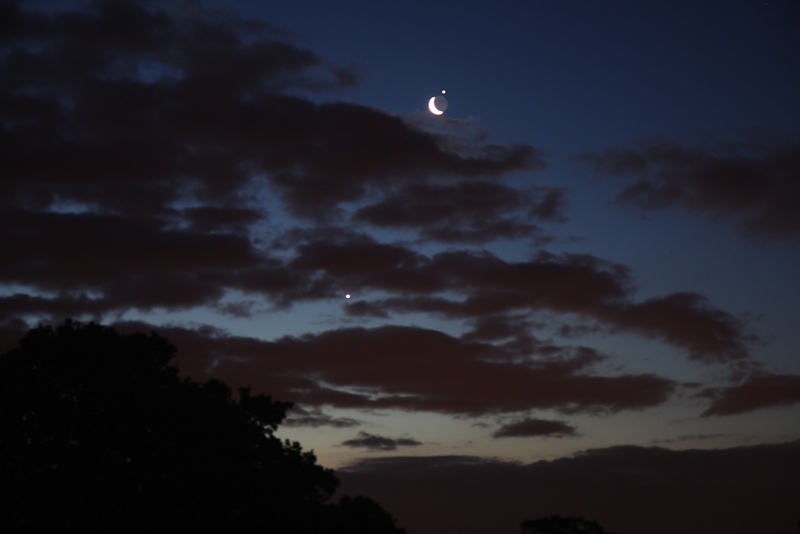 Robert Seymour captured the following images of the close conjunction (actually a near grazing occultation) of Jupiter and the Moon during the predawn skies on the 15th July 2012. All four images were taken using a Canon EOS 40D camera and a 17-55mm zoom lens between 03:25 and 03:28 BST. 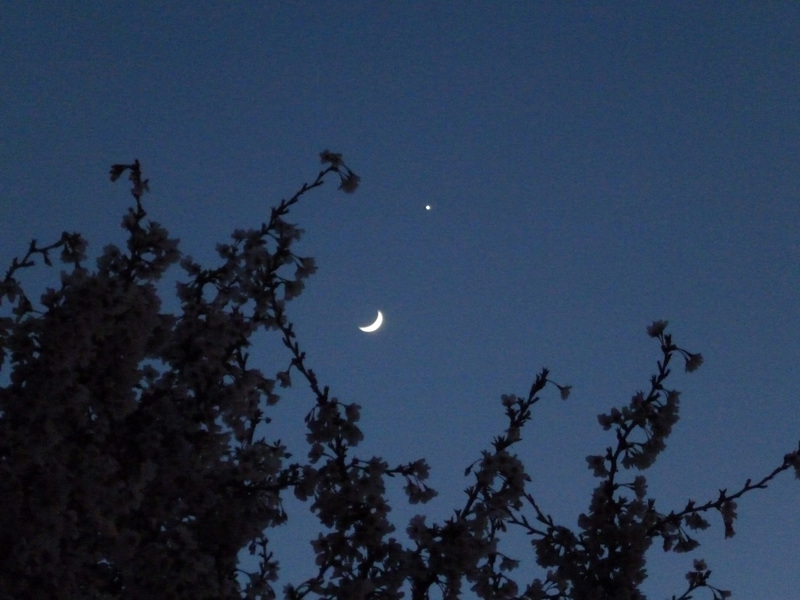 Venus can bee seen some distance below the Moon-Jupiter pairing, with the star Aldebaran visible to the right of Venus in the first of pictures. 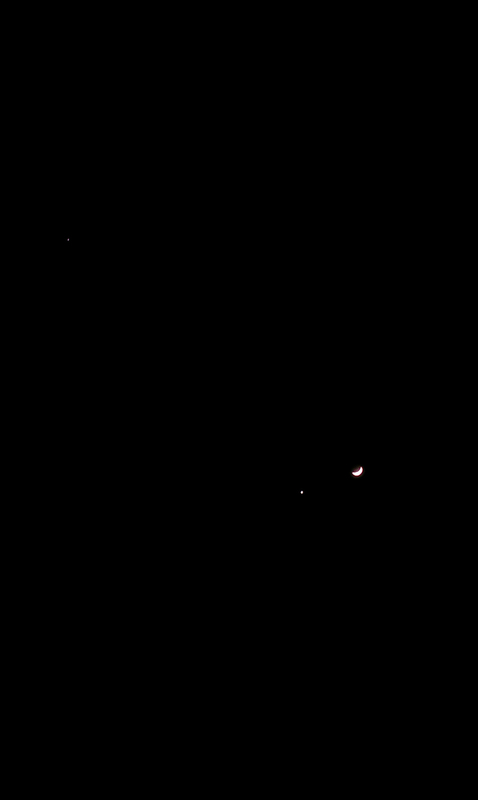 Claire Spencer took this image of the Moon and Venus on the evening of the 26th March 2012 using a Panasonic DMC-FS16 camera at f/6.5, 1/8 s exposure and ISO-800. 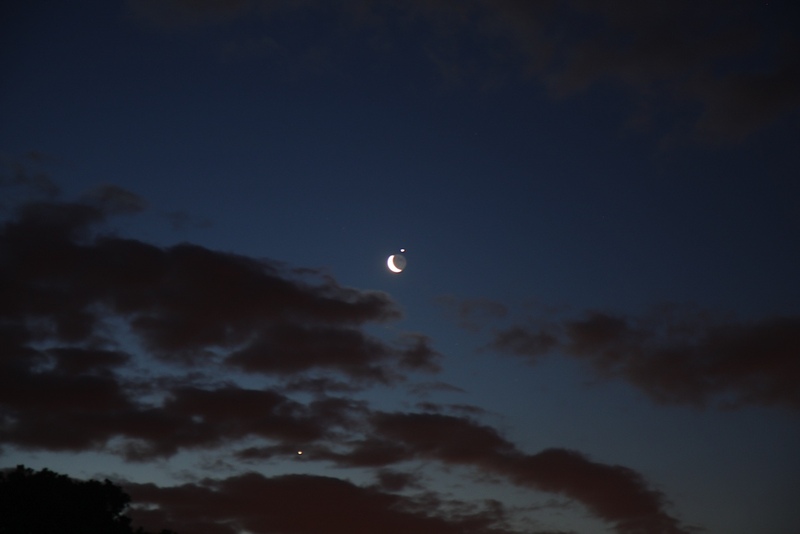 Keith Plamping took this photograph of Venus, the Moon and Jupiter on the evening of the 26th March 2012. 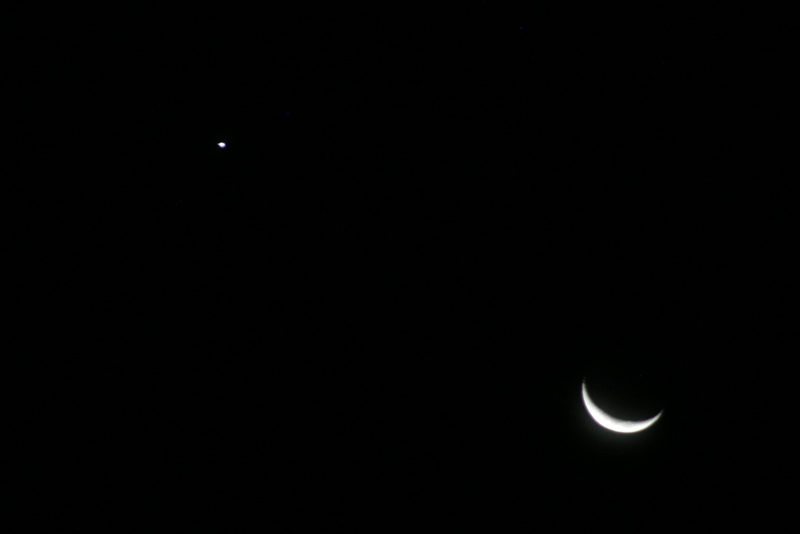 The crescent Moon shows very obvious earth-shine and Venus lies just above and to the right of it. 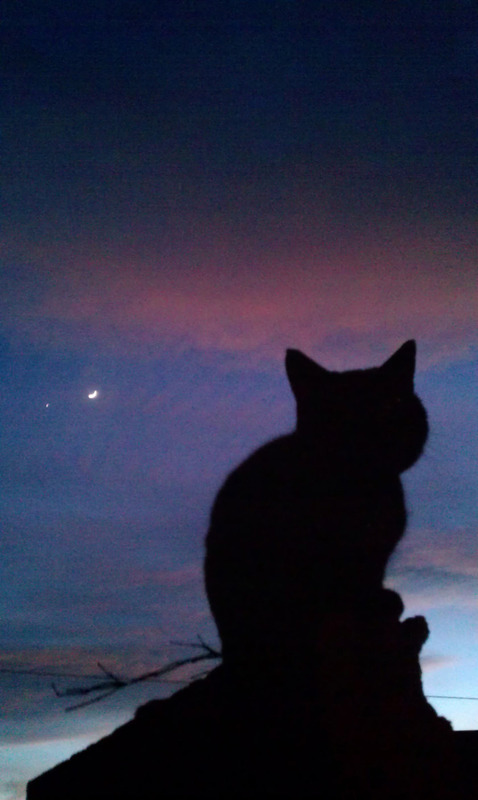 Jupiter lies some distance below the Moon and Venus. Keith used a Canon EOS 600D camera at f/4.5 and ISO-400 with a 2 second exposure. How bright does the sky have to be to render Venus invisible to the naked eye? Well, Very bright in fact! 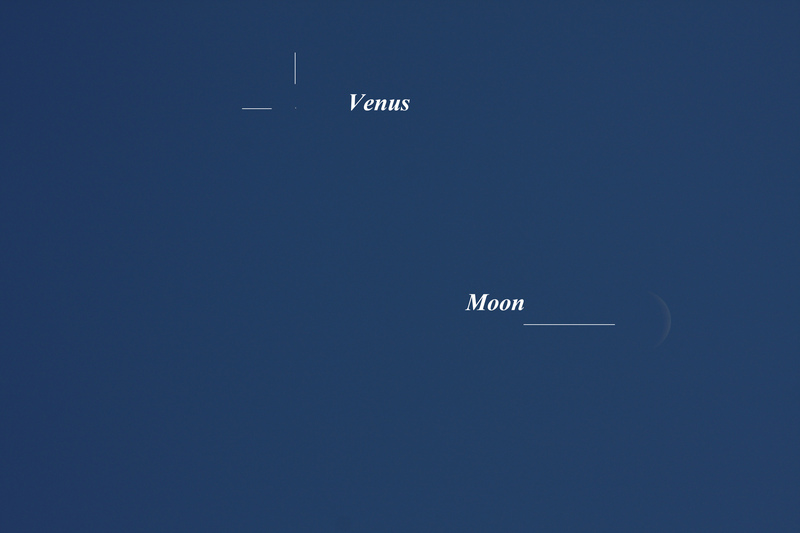 On the afternoon of the 26th March 2012 Chris Newsome managed to easily find Venus with the naked eye at about 14:30 BST to the upper left of the moon. The following two images are taken from a single RAW frame using a Canon 40D camera with a 55-200mm lens set at 200mm, 1/400th of a second exposure and f/9 at 100 ASA, EV-2. The first is the unprocessed version straight from CR2 format to JPEG. 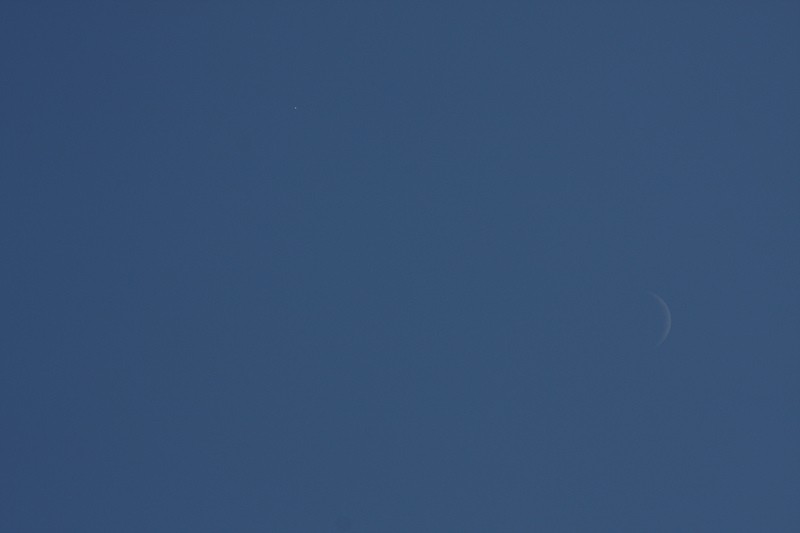 The second has been processed slightly to accentuate Venus and the moon against the sky. 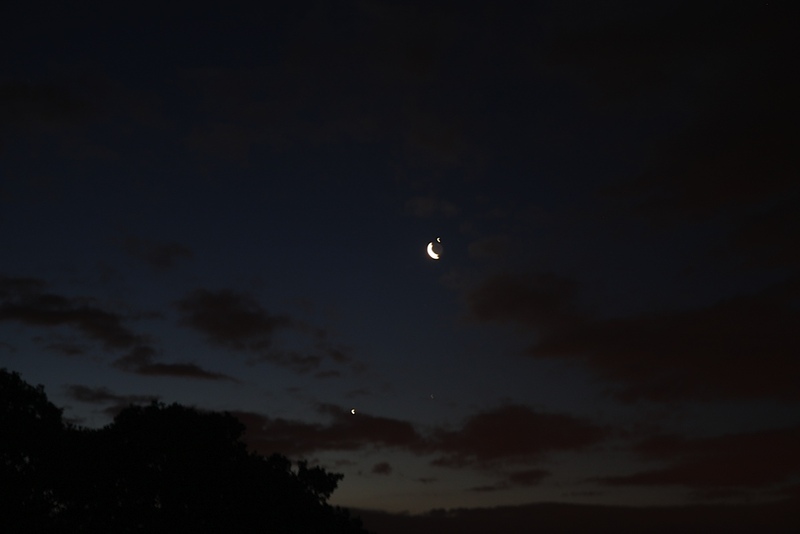 Keith Plamping took this photograph of Venus, Jupiter and the Moon on the evening of the 25th March 2012. The crescent Moon is to the left of the conifer and shows very obvious earth-shine in this exposure. 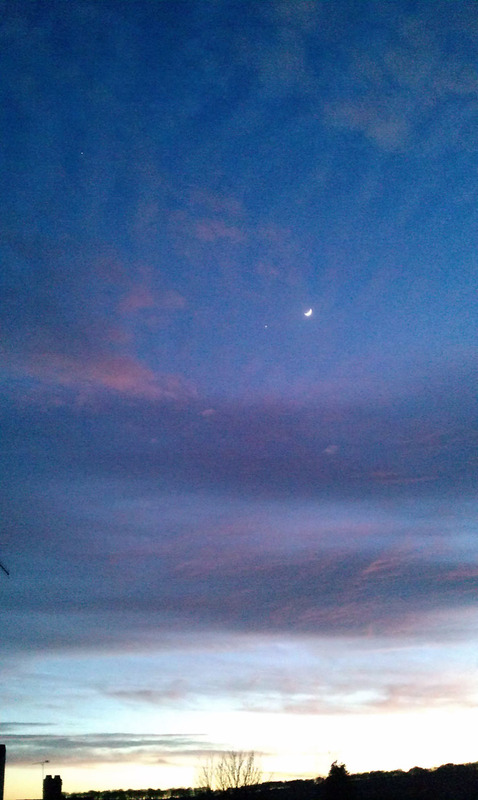 Jupiter lies to the left of the Moon and Venus shines very brightly higher up the sky. The Plieades are visible at the top of the picture and also the Hyades near the upper left corner. Keith used a Canon EOS 600D camera at f/5 and ISO-400 with a 13 second exposure. 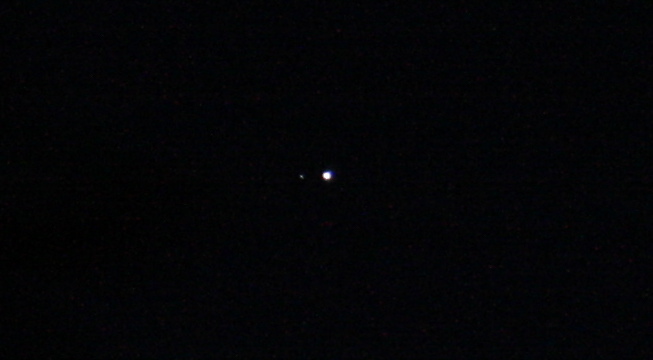 Brian Dodson took this picture of the conjunction of Venus and the Moon on the evening of the 25th February 2012 using a Canon 300D camera with a 75-300mm lens. It is a 1 second exposure at f/5.6 and ISO-400. The following picture was taken by Keith Plamping on the evening of the 25th February 2012 using a Canon EOS 600D camera with a 18-135mm telephoto lens. 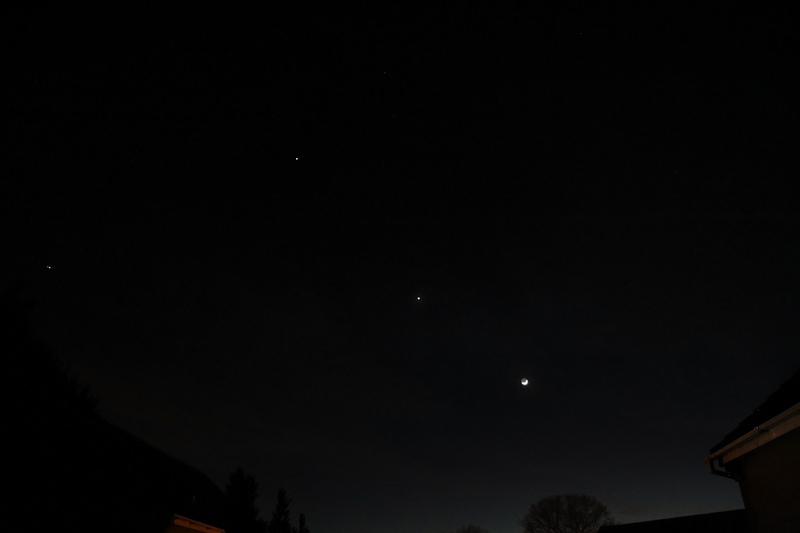 The picture shows from upper left to lower right Jupiter, Venus and the crescent Moon. The following three images show the conjunction of Venus and the Moon (with Jupiter at upper left in the first and third images) on the evening of the 25th February 2012. They were taken by Mike Lancaster from Belper using an HTC Desire HD phone. Some noise reduction was applied using Adobe Photoshop. The images were taken at 18:11, 18:16 and 19:08 UT respectively. The cat in the second image is Gladstone. 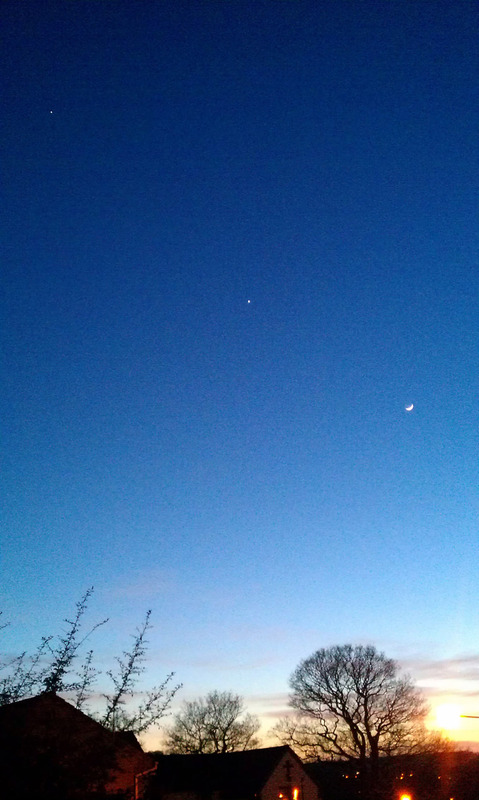 This picture was taken by Mike Lancaster from Belper on the 24th February 2012 at 18:11 UT using an HTC Desire HD phone. It shows from upper left to lower right Jupiter, Venus and the crescent Moon. 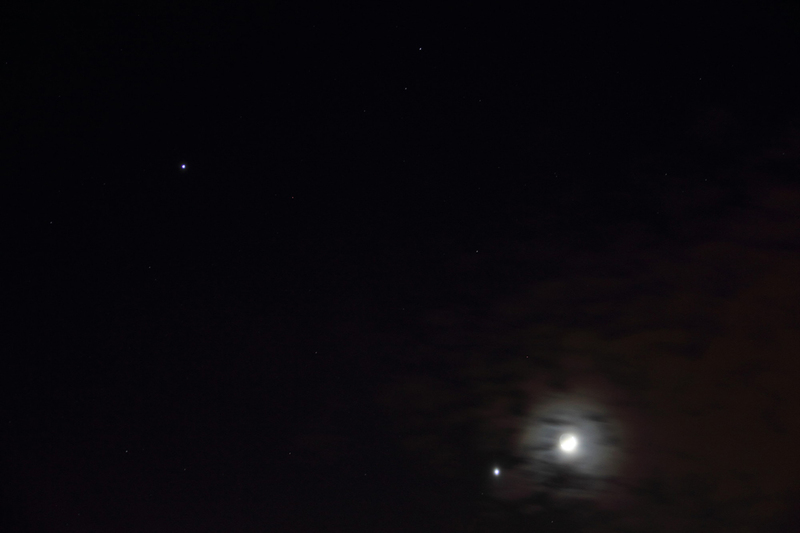 The following two pictures show from upper left to lower right Jupiter, Venus and the Moon. They were taken by Mike Lancaster from Belper around 18:40 UT using a Canon EOS 50D camera with an EFS 17-85mm lens at f/4 and ISO-1600 using 1.3 second and 0.5 second exposures respectively. Some noise reduction was applied using Adobe Photoshop. The following two pictures were taken by Keith Plamping on the evening of the 24th February 2012 using a Canon EOS 600D camera with a 18-135mm telephoto lens. The pictures show from upper left to lower right Jupiter, Venus and the crescent Moon.